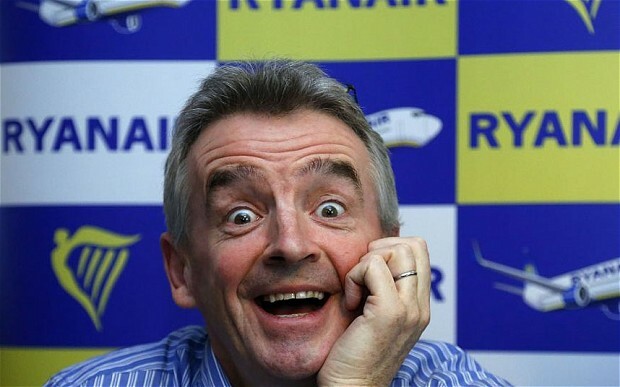 Ryanair will offer flights to the US for less than £10 when it eventually buys the long-haul aircraft it needs. Michael O’Leary, the airline’s chief executive, told the Irish Hotels Federation conference in Meath yesterday that he would offer tickets to New York and Boston for €10 (£8.20). Flights back to Europe would cost €7.30. However, he admitted that passengers would pay extra for everything from meals to baggage. The flights would leave from up to 14 major European cities to 12-14 destinations in the US. He said last year that “there is 15pc of the public who will pay for the frills and you will be mad to switch off from that”. The flights would begin within six months of Ryanair buying the long-haul aircraft needed. However, these purchases could take up to five years. Mr O’Leary has previously said that Ryanair would need “a fleet of 30, 40, 50 aircraft and not two, four or six” to start flights to the US. So in theory it will be cheaper for me to go to New York on an 8 hour flight than to go to the centre of my own city of London, which takes 2 hours anyway! I could even get a job in New York, rent a flat & come back once or twice a week and the rent would be cheaper than what I currently pay for flights..
Everyone seems to be forgetting that the only reason we need cheaper flights in the UK is because the government screws so much out of us in air taxes – for example – a flight from London to new York on BA costs £350 in airtaxes – a similar flight from Berlin to New York on a partner airline if BA (Airberlin) is only £80 in taxes. “I’d happily pay £20 if the other tenner went towards hunting down and incarcerating O’Leary in a soundproof box”. This entry was posted in Entertainment, Inspirations, Men, News, Women and tagged Cheap Airlines To USA, Ryanair To Fly Passengers To US For Under £10. ← Happy Wonderful Birthday To My Big Brother Ikem Umez.